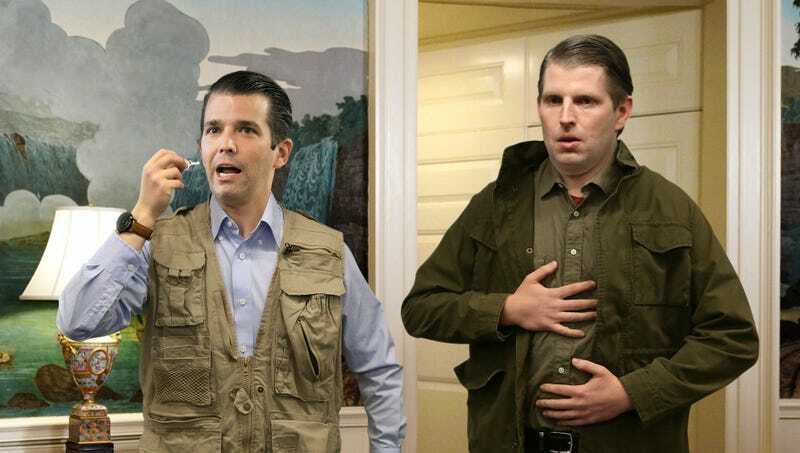 WASHINGTON—After procuring a tall glass of chocolate milk to expedite the process, Eric Trump and Donald Trump Jr. reportedly swallowed two sets of luggage keys Wednesday in case they went to jail in the near future and needed to escape. “After the keys, we need to gulp down these maps I drew so we can find our way out,” said Eric Trump, who chewed the crudely rendered map while Donald Jr. packed a suitcase with a plastic shovel, a grappling hook made from aluminum foil, yarn, and two bowls filled with Frosted Flakes and milk. “We better pack some games so that we have fun stuff to do in prison. We could also maybe use my shovel to dig under the wall in a pinch. Let’s remember to hide some Pokémon cards in our pockets so we can trade them for supplies and juice.” At press time, White House sources confirmed Eric and Donald Jr. were attempting to vomit up the keys in order to unlock their suitcase after forgetting to pack spoons for their cereal.